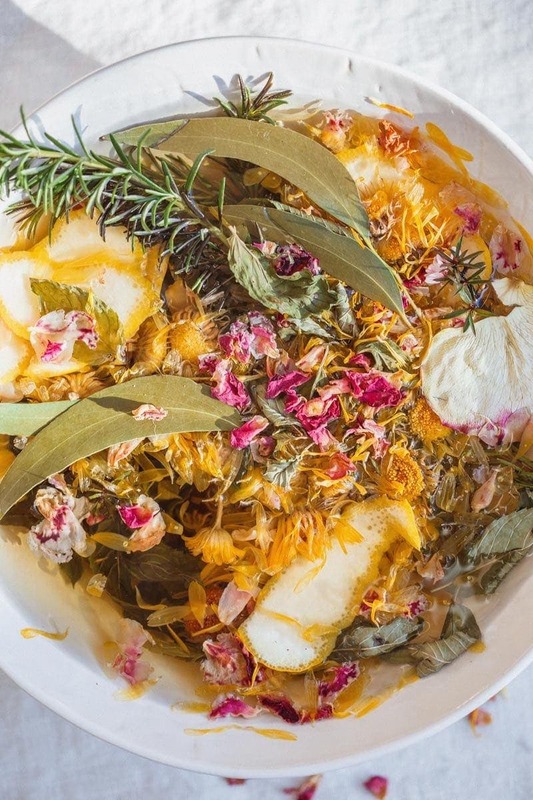 This herbal facial steam with added essential oils is the self-care ritual you will want to incorporate into your life. The combination of steam with botanicals will cleanse the skin, remove impurities, hydrate and promote circulation, aid in skin renewal and calm the nervous system. Here are some recipes for both dry and oily skin. 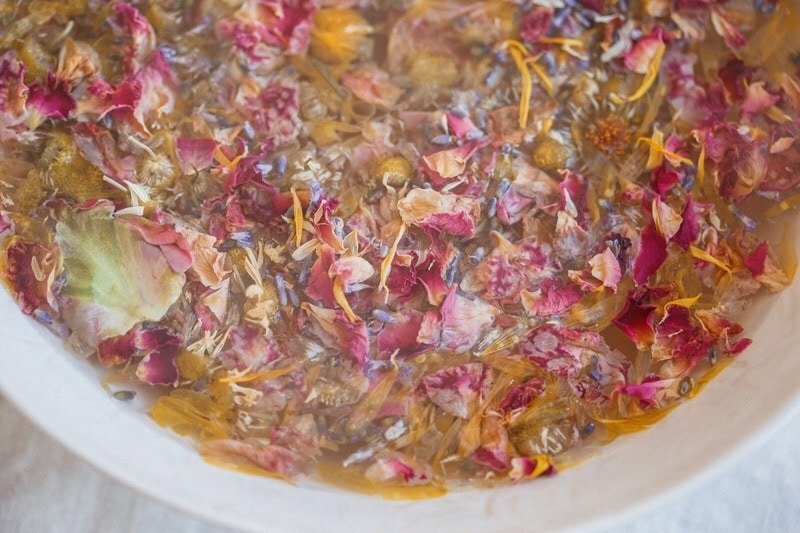 Today I’m sharing a self-care ritual I’ve been gifting myself every Sunday – a herbal facial steam with essential oils for added therapeutic benefit. Facial steams are a beautiful thing as they’re simple, affordable and effective. All you need, is a selection of fresh or dried herbs, some oils, hot water, a bowl and a towel. The hot water releases the volatiles in the plant material, carrying them up to the face where they exert their beneficial effects – the steam helping to soften and open pores so they can get to work. Afterwards, my skin feels soft, hydrated, toned and clear – heaven! 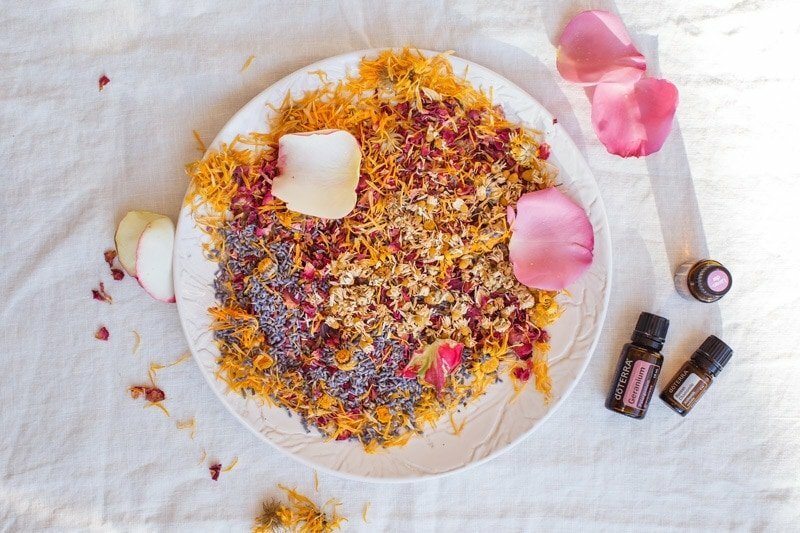 It’s simple modern rituals like these that help cultivate self-love and appreciation. Ever grateful for the medicine of plants and their ability to bring us such joy. They cleanse the skin: the steam causes your face to sweat, allowing impurities in the skin to be released. The volatiles in the herbs and essential oils also have antiseptic and antibacterial action against acne. You could follow your steam up with a clay mask to further help draw out any debris. They hydrate and promote circulation: again, because they induce sweating. The compounds in herbs such as calendula and chamomile are also incredibly soothing and moistening. Guaranteed you’ll finish with a glow! They’re anti-aging: this is in part due to the enhanced blood flow to the face, and in part due to the antioxidant activity of some of the herbs and oils. Geranium, sandalwood and frankincense essential oils deserve a mention here, as they help promote the renewal of skin cells. They calm the nervous system: particularly when you’re using herbs and or essential oils like chamomile and lavender – this is a beautiful way to help manage stress and help you relax. 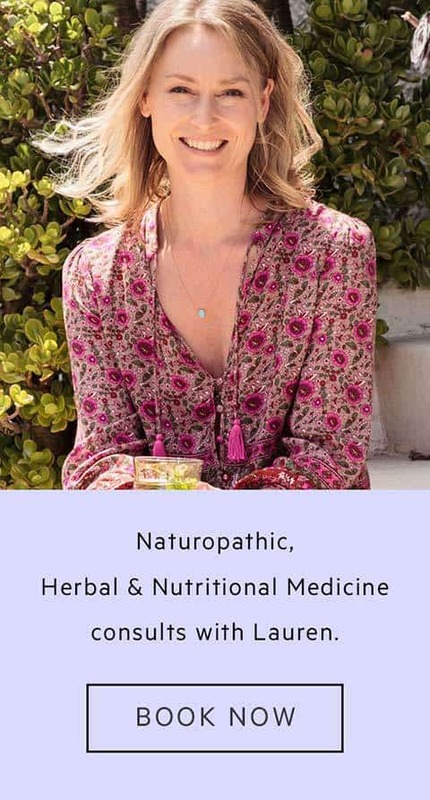 The ideal herbs to use are those that are known to support skin health, and those that are known to contain volatiles – that is – essential oils. If you tend to have dry, mature, sensitive, red or inflamed skin, then the category of herbs most valuable to you will be those that contain constituents that are slightly cooling, softening, and moistening. Think calendula, chamomile, rose, lavender, and comfrey (ALL of these can easily be grown in your garden). If you have oily skin, you’ll want to seek out herbs that have an astringent property. This means they help tighten and draw the tissues together, shrinking pores in the process. Think rose, rosemary, red raspberry leaf and sage. Often with oily skin, comes acne or blackheads. For this you’ll want herbs that are antiseptic, antibacterial and cleansing. 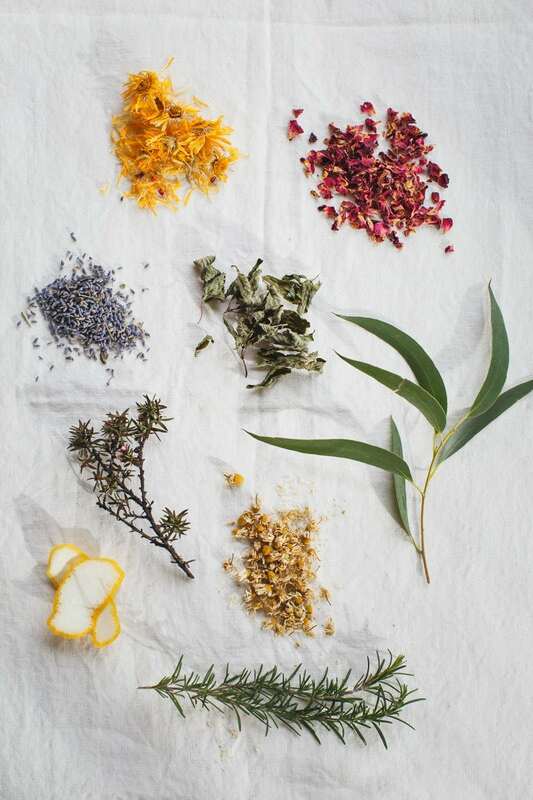 Think tea tree (or in New Zealand – Manuka), eucalyptus, peppermint and rosemary. 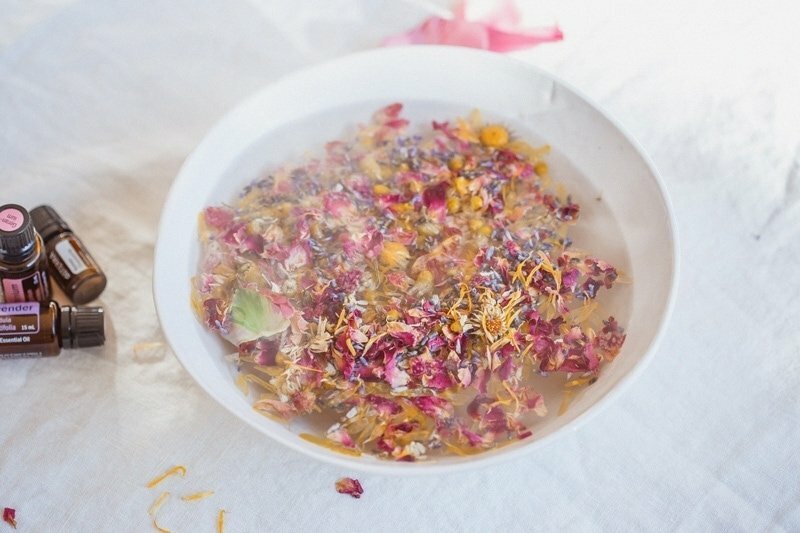 If you have combination skin, you can use a mixture of herbs, but calendula, chamomile and rose would be my top picks. 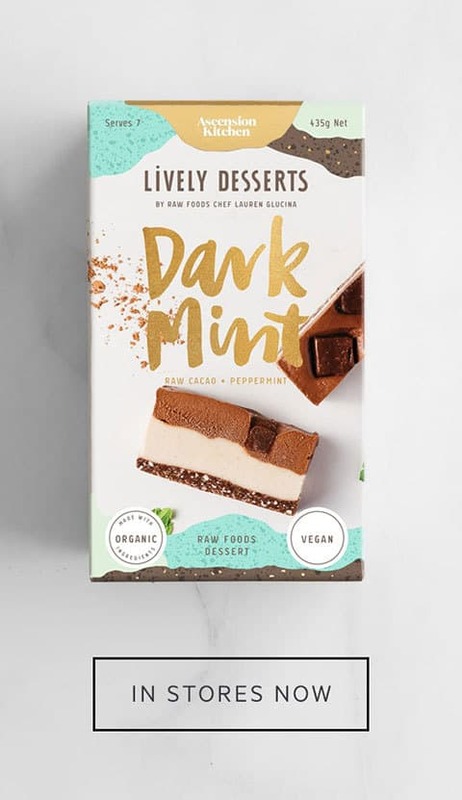 Lemon peel is something you can add no matter the skin type – it’s energising and invigorating and makes for such a lovely addition. 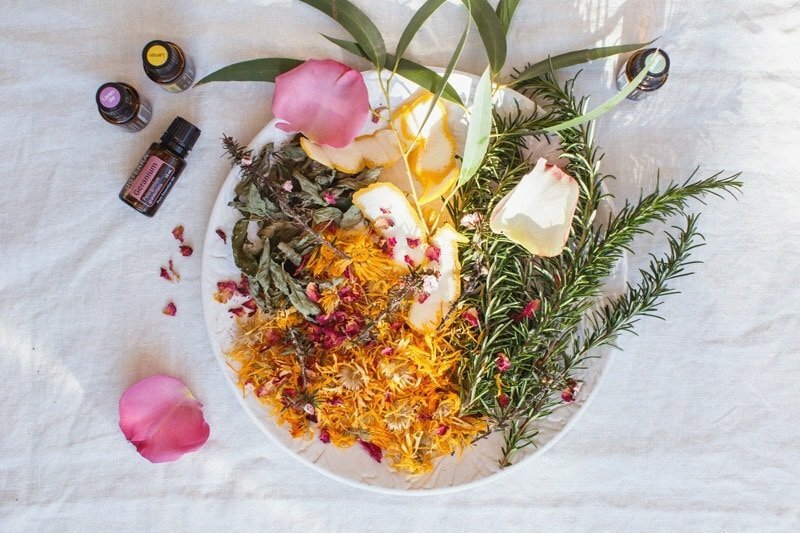 Essential oils to support skin on the dryer side include Roman chamomile, lavender, geranium, rose, sandalwood, frankincense and helichrysum (also known commonly as Everlasting). Roman chamomile, rose, sandalwood, frankincense and helichrysum are precious and expensive oils, so I prefer to use those topically for maximum benefit, however, I particularly LOVE the scent of the chamomile so do use a drop or so of that. Despite geranium being astringent (ie, drying), it is beneficial for all skin types as it is so soothing and helps generate new skin cells. For oily skin, geranium, cypress, rose, rosemary and lavender are all good options. I have two recipes here – one for dry-normal skin, and one for oily-normal skin. Be creative and add fresh flowers for aesthetics. The method is the same for each. Bring 4 cups of water to a boil in a pot and add your fresh/dried herbs. Cover and let steep for just two minutes, then transfer into a bowl. Add your essential oils, then cover your head with a towel and sit directly over the bowl to breath in the volatiles. 5-10 minutes is usually adequate. The herbs mentioned are all readily accessible – many you can grow or forage, or find packaged as tea in a health store. 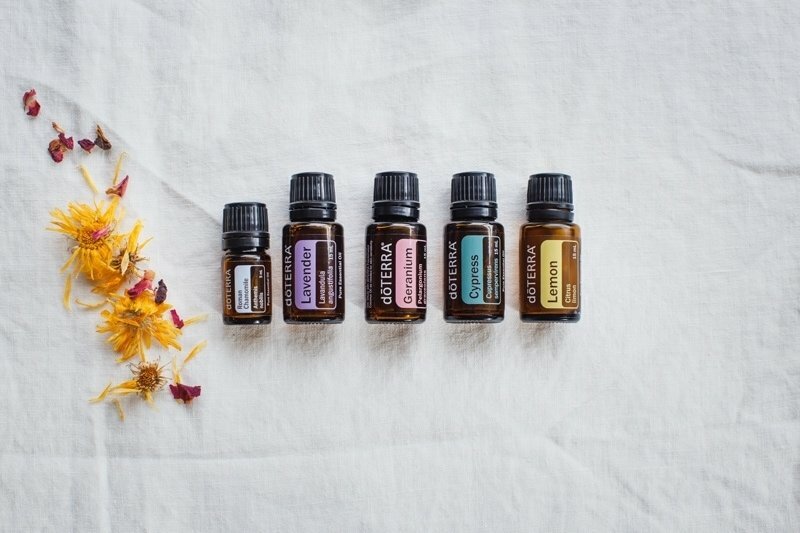 The doTERRA essential oils are available to you if you were to set up a wholesale account – this gives you an incredible cost savings, and guarantees you get the best quality, therapeutic grade oils. doTERRA have a website called sourcetoyou.com – here you can enter the batch number stamped on the underside of every bottle of essential oil, and pull up the gas chromatography report on that particular batch. This report will show you exactly what constituents are present, and affirm that it is free from any contaminants or adulterations. These reports are all third-party generated, and they provide a level of transparency not seen by any other essential oil supplier. As an example, when I entered the batch number for my little bottle of lavender – I can see in the report generated that it is pure and meets the chemical profile expected for the medicinal Lavendula angustifolia. When I look at the gas chromatography report, I can indeed see that the constituents Linalool and Linalyl acetate account for over 60% of the oil’s profile (as they should). If you’d like to get started with your own account, you can either book a complementary consult with me to learn more first, or join with doTERRA right away. Thank you for reading, I hope this has inspired you to get a little Witchy over the weekend!